The largest mobile man-made structure the world has ever known has come to the shores of Mega-City One and people are flocking to the island with sin on their mind. However, hiding amongst the dens of iniquity and vice is international terrorist Ula Danser, waiting to release a storm of devastation on the citizens of the Big-Meg. 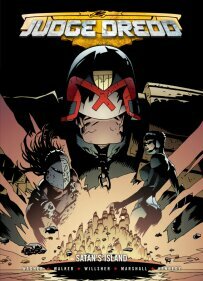 It’s a race against time as Dredd and his team try to find Danser before all hell breaks loose! 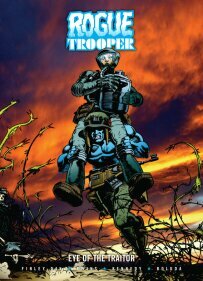 Last of the Genetic Infantrymen Rogue Trooper has gone AWOL with the bio-chipped souls of his dead comrades Helm, Bagman and Gunnar, determined to hunt down the Traitor General that betrayed the G.I.s. Now, in this latest collection of his adventures, he faces a murderous handgun in ‘Major Magnum’, the horror of living barbed wire in ‘Bio-Wire’ and shocking revelations about his past in ‘Milli-Com Memories’! Odysseus City, the near future. 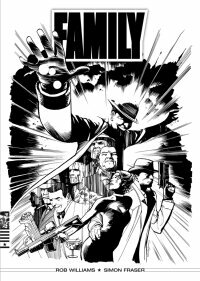 The Family runs things around here, but they aren’t your average mobsters. They are a select cadre, bonded by blood, whose powers extend way beyond the usual. When OCPD cop, Kurt, gets involved with the bosses’ daughter he sees a way to bring about the downfall of the crime lords. However, somebody else has the same idea. Somebody who should have died over twenty years ago!